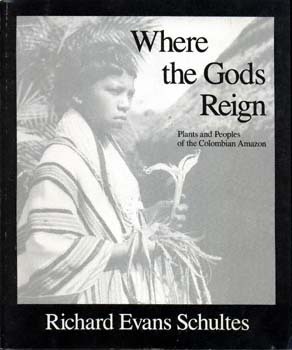 "Where the Gods Reign is a magnificent book by one of the greatest Amazon explorers of this century --a must for the library of any Amazon oriented person . . .a work of art as well as an addition to the popular literature on the Amazon. It is to be hoped that this book will help to inspire people to greater efforts to protect the Amazon forest and the pitiful remnants of the great people that inhabited the region. The author's love for the forest and the peoples are a challenge to all of us." "Simply put, Where the Gods Reign joins Bates and Humboldt in the library of necessary naturalist tomes." "Where the Gods Reign is a vivid illustration of the evolutionary relationship between man and the biome he lives in. Dr. Schultes, the legendary ethnobotanist of the Amazon, has been a pivotal figure in the effort to inventory, tap, and conserve the genetic wealth of the tropical rainforests --in this book, he succeeds in communicating the individual fulfillment harmonious cooperation with the rainforest can give humankind." Boston-born and Harvard-educated, Richard Evans Schultes is Jeffrey Professor of Biology and Director of the Botanical Museum of Harvard University (Emeritus). Botanical explorer, ethnobotanist and conservationist, he has worked in the American tropics, particularly the Amazon, since 1939, specializing in medicinal and toxic plants used in aboriginal societies and on new sources of rubber. He has been the recipient of numerous awards, including Colombia's highest honour, the Cross of Boyaca, and the annual Gold Medel of the World Wildlife Fund, presented by HRH Prince Philip; most recently he received the prestigious Tyler Prize for Environmental Achievement. He is a member of the National Academy of Sciences, the American Academy of Arts and Sciences, the Linnean Society of London and several Latin American Academies.